1 JOHN 4:12 KJV "No man hath seen God at any time. If we love one another, God dwelleth in us, and his love is perfected in us." 9In this was manifested the love of God toward us, because that God sent his only begotten Son into the world, that we might live through him. 10Herein is love, not that we loved God, but that he loved us, and sent his Son to be the propitiation for our sins. 11Beloved, if God so loved us, we ought also to love one another. 12No man hath seen God at any time. 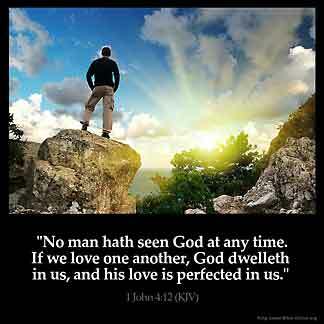 If we love one another, God dwelleth in us, and his love is perfected in us. 13Hereby know we that we dwell in him, and he in us, because he hath given us of his Spirit. 14And we have seen and do testify that the Father sent the Son to be the Saviour of the world. 15Whosoever shall confess that Jesus is the Son of God, God dwelleth in him, and he in God. No man hath seene God at any time. If wee loue one another, God dwelleth in vs, and his loue is perfected in vs.
No one has ever yet seen God. If we love one another, God continues in union with us, and His love in all its perfection is in our hearts. No man say euer God; if we louen togidre, God dwellith in vs, and the charite of hym is perfit in vs.
4:12 If we love one another, God abideth in us - This is treated of, #1John 4:13 |- 16. And his love is perfected - Has its full effect. In us - This is treated of, #1John 4:17 |- 19. 1Jo 4:12 No man hath seen God at any time. He is invisible to mortal eyes, yet we may have a sense of his presence in us. If we love each other he dwells in us. His love is perfected in us. It is made complete by our loving each other. It is incomplete unless his love for us is supplemented by brotherly love. This love in us is the proof that God is in us. Love is the nature of God and as Children of God we should love everyone including our enemies. God is invisible, no man has ever seen him except his only beloved son. Eventhough, when Moses was anxious to see him, he said no one can see me and live. But, if we love one another, he dwells in us and his love is perfected in us. How can you say you love GOD that you can 't see and yet won 't see eye to eye with your brother who is created in the image of GOD. May HE have mercy on us.